Born to ski, Jossi Wells from Wanaka, New Zealand, hit the slopes aged two years old. His many achievements have included being the youngest competitor at the Winter X Games and placing 4th in the Half Pipe at the Sochi Winter Olympics in 2014. But if you ask Jossi what his greatest achievement is, the recklessly handsome young man will tell you it’s the day he wed his beautiful wife. “She’s always up for adventure and keeps me on my toes,” the Kiwi Freeskiing champion says of his new bride. “She makes my life exciting every single day.” And if you’ve ever seen her Instagram, you’d understand completely what Jossi is talking about. Known as @faithlord, Hannah Lord Wells is a creative director, photographer, and stylist, as well as being one of the coolest chicks I’ve ever met. Chic doesn’t begin to describe Hannah – her effortless elegance is as much due to her inimitable style as her snowy-white beauty. It’s no wonder the young ski legend fell for her. Although it wasn’t love at first sight. Hailing from Minnesota, USA, Hannah’s parents are both artists, so creativity is in her blood. When the time came to choose where to marry, the choice was simple. Hannah’s younger brother Joshua has leukaemia and so home to Minnesota the young pair went for their nuptials among both their large families and many friends. “We’d always wanted to get wedding photos in Wanaka and we were so happy to be involved with this great team of people dedicated to showing the beauty and majesty of Mt Aspiring National Park and the Lake Wanaka region.” For Jossi, the photo shoot had a special appeal. He’s been skiing these very mountains since he was knee-high to a native Kea. His first heli-ski at age nine, and Jossi Wells took to it like a kid to ice cream. He also told me he had always wanted to propose to Hannah on Roy’s Peak, a peak that soars above Lake Wanaka and is world famous for wedding photography, but it just didn’t end up happening that way. Thanks to the awesome team of local industry professionals in the Lake Wanaka region, Jossi’s dream of taking his bride to Roy’s Peak and into the mountains of his childhood were magnificently realised. Wanaka’s Tracey Morrow from Crimson Floral Design created a breath-taking bouquet, channelling Hannah’s original bouquet without any prior knowledge! Pheasant feathers and roses cradled the dusk-grey Protea creating a bohemian rhapsody of floral perfection. Kelsey Genna from The Flower Bride came to the party with her stunning Florence Gown. Delicate and feminine with hand-cut silk georgette frills, the Florence gown embodied Hannah’s pure and graceful beauty. Inspired by the magical scenery, photographers James Frost, Mark Clinton and videographer Tom Coburn, captured the essence of this truly beautiful love story. Blessed with clear skies and vast snowy peaks abundant in Wanaka during winter, these three young professionals created magic with a lens, giving Jossi and Hannah a montage of their love in the Southern Alps to have forever. The Lake Wanaka region is among the most romantic and beautiful places in the world. There is an enigmatic freedom about the region. Extraordinary, pristine and utterly spectacular, the landscape is otherworldly. Epic mountains, a looking-glass lake, scenery both awe-inspiring and timeless – the Lake Wanaka region is more than a pretty picture. The incredible beauty of the landscape is reflected in the hearts of the people. 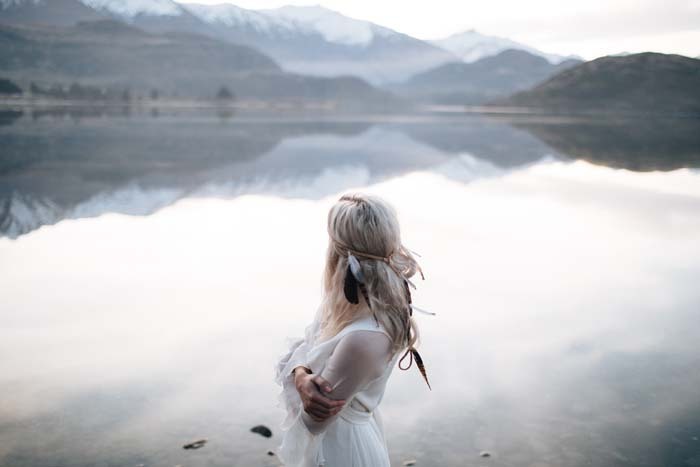 Everyone involved in the shoot, and indeed everyone in the industry in Wanaka truly love what they do and this miraculous place they live in, and love to share their passion for romance and weddings and the Lake Wanaka region.